Neither on the front nor on the back of these cards does Claro provide the information which they said it was my fault for not knowing — but in any case my Internet stick did not run out of time because of what they alleged, but because their system went down. Late on a Sunday afternoon, it was about time for my Claro.com wireless Internet modem to run out of time. I pay $15 plus taxes — a little more than $16 — to get a month’s worth of Internet service. Out here in the boonies of Cocle, Mexican billionaire Carlos Slim’s company has a monopoly. There are no phone lines, no cable TV lines, and no other wireless Internet service provider’s signals reach here. I had just had a Claro.com cell phone donated, which would allow me to recharge the chip without going into town to have a Claro dealer do it. It was a matter of going to the mini-super, getting $15 worth of prepaid cards, taking the chip from my modem stick and putting it in the cell phone, punching in the codes from the prepay cards, getting a confirmation message that the $15 had been successfully registered, and, no further prompt message forthcoming, taking the chip out of the cell phone, putting it back into the modem and getting into a Sunday night work shift. On Wednesday morning my Internet connection went dead. I was getting the signals that typically mean one of two things. Either the system was down — as sometimes happens when a lightning storm disables the tower to and from which my modem sends and receives — or the time on the modem chip has expired. There were no storm clouds on this El Niño drought morning, but maybe they were working on the line. It was no huge deal anyway, because I was about to start on a book chapter, working from copious notes and editing photos that had been taken over a too-prolonged period. If the system was down for a while, I didn’t need to be working online anyway. I could wait for the service to come back. 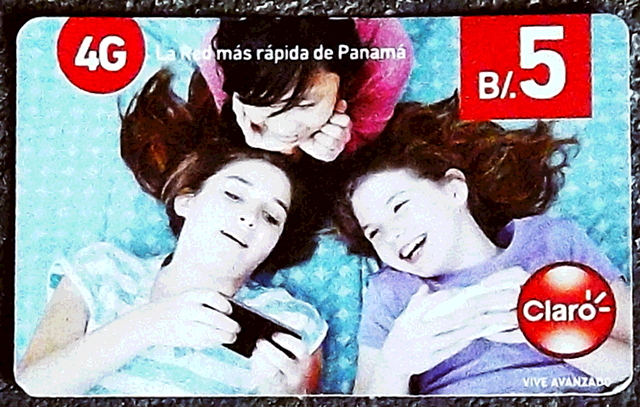 This is Panama, where time is not supposed to be money, but just time. Got my work done after a long session, went to bed and conked out before I got through three more pages of the science fiction novel I’m reading. Roosters crowing and a dog’s insistent wet nose got me up sometime around the crack of dawn. After going out to check the state of the water system and to harvest that day’s crop of long Chinese green beans — while Baroncito The Wonder Dog busily sniffed to see who had been by in the night and renewed his scent markers on all the right trees — my canine friend and I went back inside, I got the coffee maker going and I sat down in front of the computer. It was Thursday morning and the Internet connection was still down. That’s something of an emergency for The Panama News, which might mean inquiries and arrangements with Claro, and might mean working out of an Internet cafe that day. As in, get on the bus and go into Penonome. This was an extra added annoyance because this is August, a slow month for readership and donations, a time when expenses don’t go away but bus money (etc.) must be carefully rationed. This reporter was living close to the edge. At the Claro place upstairs from the supermarket right near the entrance to town, I explained the situation to the lady. She took my chip and put it into a device of hers, and said that I had no time on that chip. But wait, I said, I recharged it on Sunday, and it went out on Wednesday morning. But she said that I never did recharge it, because after receiving the confirmation message I was supposed to confirm the confirmation and set the chip to monthly Internet service. Well, then, how was it that I had Internet service on Monday, Tuesday and into Wednesday morning? I didn’t get an explanation I believed, but to get online again I had to buy another month of Internet service, which she entered onto my chip. This was a plan changer, because the money for another month’s worth of service was my bus fare for things I planned to be doing. Thus recharged, I went down to the market area to get the bus back home, put the stick in the mini-laptop I carry around — and got the same signal that means that the system is down or there is no money in the chip. I got off the bus, went back, and the lady at Claro made a call, told me that the prepay card system was down and I had to go to the claim center, next to Super 99 a couple of miles up the Pan-American Highway. No big deal — like all rich gringos all I had to do is jump in my car and I’d be there in no time flat. But no refund at this place — go away, take it to the complaint center. A walk of several miles is good for this reporter Maybe not the sun. I got to the Claro claim center sweaty and annoyed, and found myself in a line behind three senior citizens and a young man, and all had the same complaint as mine. Their prepaid Internet service went out on Wednesday morning and should not have. The lady at the claim center said that the system was down and that soon enough I would get service back on my new Claro.com recharge. But what about the money I put in on Sunday night? She gave me a variation on the theme. She said by not confirming the confirmation in the unspecified by Claro way, my stick was paying at a different rate, by the gigabyte instead of by the month. And miraculously, after about two and half days’ use, just when the whole system went down I ran out $15 worth of service. She looked on a screen in the back and said that this is what it was — but of course, I didn’t get to see the screen. No refund or credit. So how do you say “Stick ’em up!” in Mexican Spanish? Or do they use the terminology they learn at MBA programs in the United States?